A lot can happen within an academic advising appointment; courses, extracurricular activities, and internships are often discussed, and graduation plans are made. But for Animal Sciences major and Army ROTC member Kellie Garrity, she learned that The Ohio State University did not have a student organization to support the Wounded Warrior Project (WWP). The WWP (www.woundedwarriorproject.org) is a non-profit organization that supports veterans and current service members who have suffered a mental injury, illness, or wound while serving. Their specific focus is those who have served or are serving after September 11, 2001. Garrity recruited fellow Army ROTC members Krystal Wheeler (a junior from Hilliard, majoring in health science) and Elizabeth "Lizzy" Williams (a junior from Ostrander, majoring in cognitive/computational neuroscience) to serve as organization officers and help establish a WWP at Ohio State. The three divided the tasks required by Student Life to start a new organization. One of the requirements was finding a faculty advisor for the organization. Garrity immediately remembered her advising appointment with Animal and Meat Sciences Assistant Professor Dr. Lyda G. Garcia, and knew she was the perfect person. The three student leaders are currently busy preparing for their first meeting on Monday, November 5th in the Recreational and Physical Activity Center (RPAC) at 6:00pm on the stairs behind Juice 2. They plan to hold monthly Monday meetings. Additionally, they are brainstorming fundraisers to help local veterans. Hosting local fundraisers will also help the student organization register with the national WWP. Membership recruitment efforts have been in the form of campus flyers, word-of-mouth, and a Facebook page (@WoundedWarriorProjectOSU). The organization is open to all students, not just those with military ties. 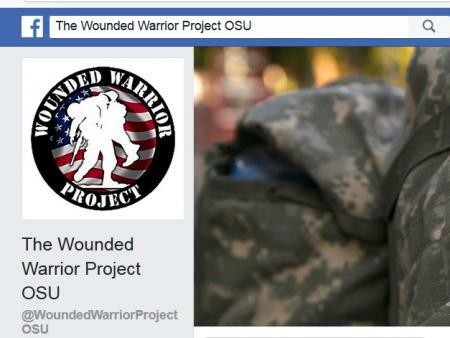 Wounded Warrior Project OSU will hold its first meeting on Monday, November 5th at 6:00pm in the RPAC Lobby behind Juice 2. For more information on the organization, you can like their Facebook page @WoundedWarriorProjectOSU or contact them via woundedwarriorprojectosu@gmail.com.